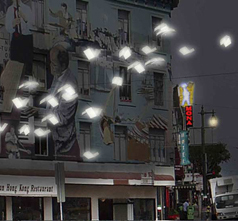 Language of the Birds, by Brian Goggin with Dorka Keehn. Photo courtesy Artdaily.com. This art installation is at the corner of Broadway and Columbus Avenue, about eight blocks from the conference hotel. Conference attendance is only open to GIA members, as well as staff and trustees of organizations that are eligible for GIA membership. These include private, community, corporate, and family foundations; public sector grantmakers; regranting organizations whose primary purpose is arts grantmaking; and individual donors who give through eligible organizations. Membership is not required for conference attendance. If you have questions about eligibility, please call GIA: (206) 624-2312. Please note that all other conference events are not open to guests. Click here to log into your registration profile if you wish to cancel or make changes to your registration. Cancellations made prior to September 1, 2011: refund of 90% of registration paid. Cancellations made from September 2-20, 2011: refund of 70% of registration paid. After September 20, 2011, conference fees are non-refundable. To preserve the capacity for open discussion, all attendees must refrain from fundraising or solicitation. Organizations that solicit funds are expected to be represented only by individuals whose roles involve programming and/or policy, and not by fundraising or development staff.